Axminster – Made a bit like an oriental rug, with fibres woven in and out through the surface backing on an Axminster machine. 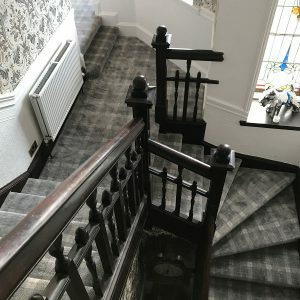 Axminster carpets are known for their rather grand, intricately patterned designs, quality and durability – and they are expensive. Until recently, most Axminsters came in a velvet finish, but now manufacturers are using twisted yarn as well, to reduce shading. Wilton – Another luxury, quality carpet, it derives its name from the type of loom used, which weaves the yarn in a continuous strand. Available in a wide range of patterns, Wilton carpets have a smooth, velvety, woven surface. This product is already saved in your wishlist!